In case you missed it, the 48th Annual O’Reilly Auto Parts World of Wheels was featured during WGN-TV’s Midday News and highlighted in the Southtown Star. 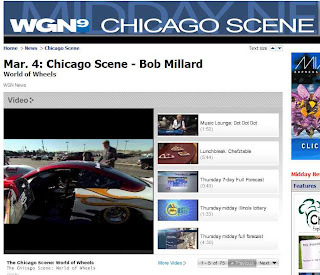 Check out a clip of Larry Way showing WGN anchor Steve Sanders the Summit Racing Series car, a 2,500 horsepower auto! See the Summit Racing Series car and much more at this weekend’s O’Reilly Auto Parts World of Wheels show, taking place March 5-7, 2010 at Donald E. Stephens Convention Center (5555 N. River Road, Rosemont, Ill.). The event hours are Friday, 3 p.m. to 10:30 p.m., Saturday, 10 a.m. to 10:30 p.m. and Sunday, 10 a.m. to 7 p.m. Tickets are still available! Purchase tickets at the door or buy discount pre-sale tickets at O’Reilly Auto Parts locations. For more information, visit www.worldofwheels.com.